Today’s photographs (except photo 3) and write-up were organized and contributed by Adolf and Oluna Ceska. Thank you, I very much appreciate your efforts! In May, 1875, John Macoun collected a small prostrate plant “in ditches at Victoria” that William Trelease described two years later as Macoun’s meadowfoam, Limnanthes macounii. It is a winter annual that germinates after the first heavy rains in fall, grows only a little during the winter, flowers in late March (photograph 1) and produces up to four nutlets per flower by the middle of May (photograph 2). After Macoun’s discovery, two Victoria botanists, C.F. Newcombe and J.R. Anderson, knew the species from about four sites at the Victoria waterfront. When they both died in the 1920s, the species was forgotten. In 1957, Hitchcock and the other authors of Vascular Plants of the Pacific Northwest pronounced it extinct. Its extinction was short-lived: in the same year Limnanthes macounii was rediscovered by James A. Calder on Trial Island and shortly after by M.C. Melburn and Sarah Armstrong on Cattle Point and Uplands Park in Oak Bay, a municipality bordering on Victoria. 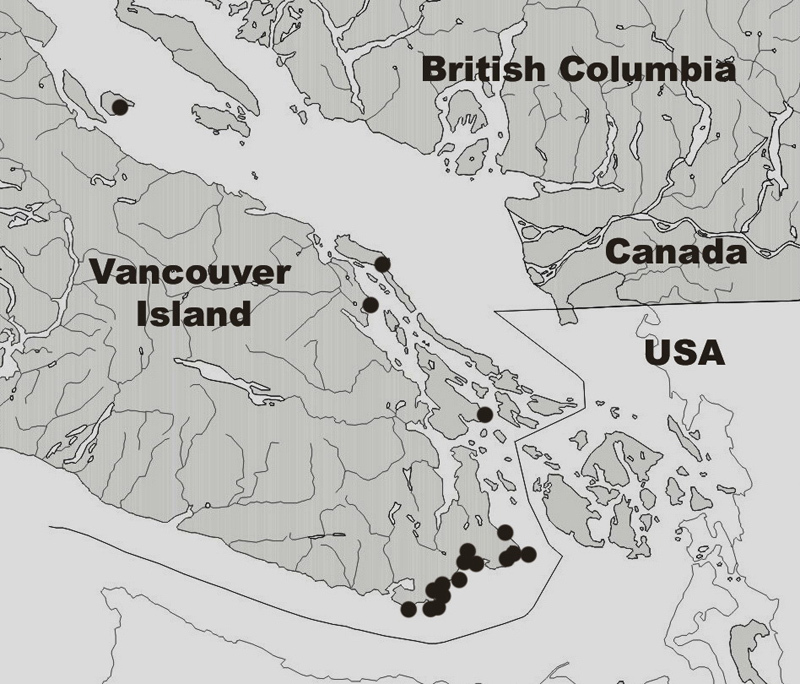 Macoun’s meadowfoam (PDF) is a narrow endemic that occurs only at the southern tip of Vancouver Island and on a few adjacent islands. We now know it from about 28 sites extending from East Sooke Park to Victoria, Salt Spring Island, Yellow Point, Denman Island, and Hornby Island (map). Plants occur in seasonally wet depressions or along intermittent seeps in low elevations and usually close to the ocean. 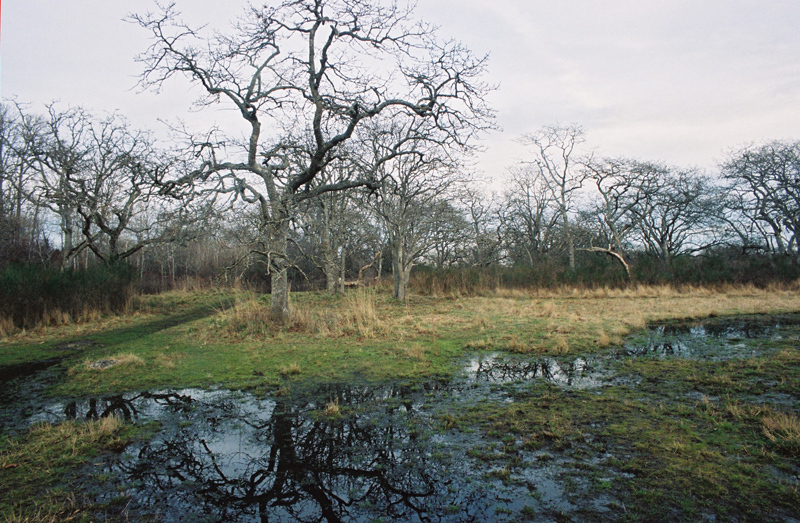 The majority of the sites are in open areas of Garry oak ecosystems (last photograph). Several localities are in wet depressions in open Douglas-fir forests. Urban development and competition of introduced plants are the main threats to Macoun’s meadowfoam. Our observations show that about half of known subpopulations of this plant either declined or disappeared from 1988 to 2004. The species is considered threatened in Canada and red-listed in British Columbia. In 1998, Eva Buxton found a large population of a plant that was identified as Macoun’s meadowfoam in a California cabbage field, but so far it has not been found outside this cultivated area. 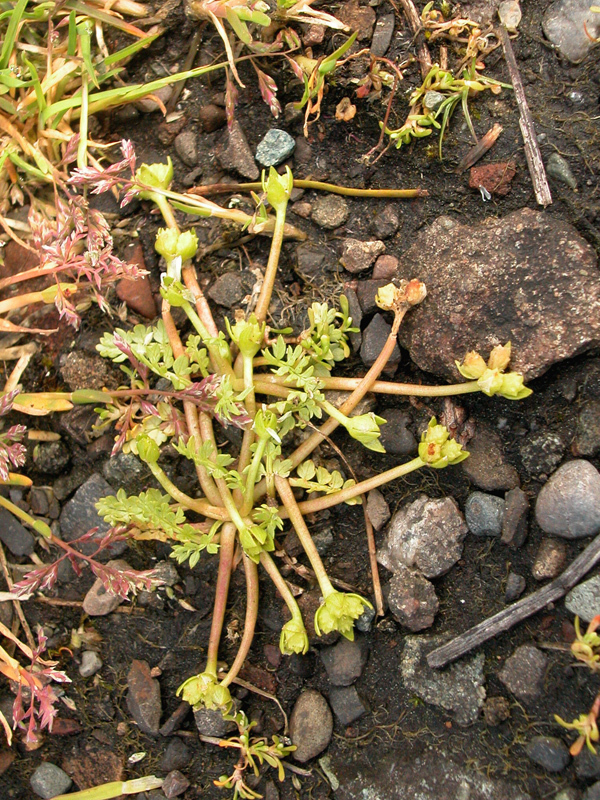 The California plants differ from those in British Columbia in a number of features—the California population likely represents a yet undescribed species (photograph 3, image courtesy of Avis Boutell). Additional photographs of the California taxon are available via CalPhotos, though presently labeled as Limnanthes macounii. 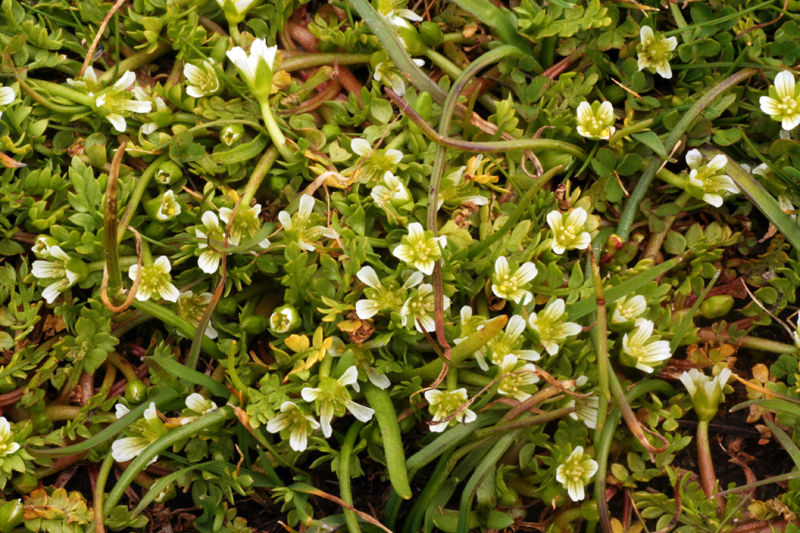 Source information: COSEWIC Assessment and Update Status Report on the Macoun’s meadowfoam (Limnanthes macounii) in Canada (PDF). Lovely, subtle little plant, with an appealing name, “Macoun’s meadowfoam”. I’d love to see those tiny flowers magnified, to have a close look at them. It’s interesting to see a species that has such a restricted range. The foliage looks quite diffeerent in the California plant (3rd photo). We have Sebastopol meadowfoam that only appears in winter/spring in the open oak meadows in the vernal pools of western Sonoma County, CA. It is endangered here for the same reasons given for Macoun’s meadowfoam. It is lovely to drive by the little patches in the fields. How about a full-frame-foty-of-the-flower [how’s that for alliteration?]? Lovely presentation! Very odd that it should be completely absent from e.g. San Juan Island – has it and other WA islands been fully searched for it? is there still some interest in using the nutlets of more abundant species for high grade oil production, saving our whales? 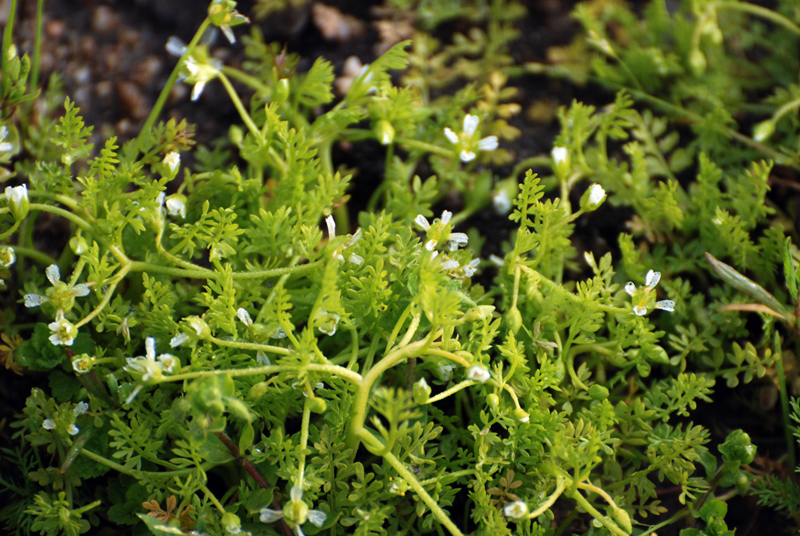 Micheal, Other Limnanthes sp are very habitat specific, preferring vernal pools that dry up early in the spring. The locations on the map all seem to have a similar southern exposure. These areas would most likely dry out earlier than other sites. Maybe by checking low lying areas around the Historical Park on San Juan island might yield results.